I've always admired originality and this fish has it. Well, at least in the sense that nearly 20 years ago it was the first "white spotted" pleco available. Nowadays there are a vast array of similarly patterned suckermouths - the so-called snowball, vampire, opal and gold spot plecos to name but a few - are commonly available to spoil the swelling ranks of "Pleco People" with new and interesting varieties on a common theme. 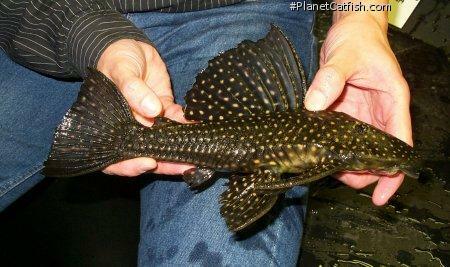 Yet this month's fish was the first imported white spotted pleco. In case you were wondering I'm not including the starlight bristlenose (Ancistrus sp. "dolichopterus") because it's not so much spotted as "dusted" with white flecks. Picky eh? This fish is has previously been identified as H. regani which was described earlier in 1905 - both fish coming from the Rio Piracicaba in the São Paulo State of Brazil. Another reason that complicates matters is, to quote a certain celluloid trilogy, "There is another". Hypostomus albopunctatus (albo = white, punctatus = spots) was collected and described in the same locality and year as H. margaritifer. Commercial imports in the 80s & 90s have occasionally given us a very similar Loricariid which is more elongate and has a noticeably higher dorsal fin. The white spotting on these fish is more irregular and does not form parallel dotted lines along the fishes flanks as seen in H. margaritifer. If it wasn't for this last difference you would be tempted to think that these fish could be male and female of the same species. The third species, H. albopunctatus, is a more slender, vertically compressed fish with lower contrast markings. It appears to reach a smaller adult size too. The image (right) of the underside of this fishes mouth, taken while it is attached to the aquarium glass is an unusual view of any fish yet you will encounter such pleco photographs in both scientific and hobbyist literature. Aside from passing interest you may ask why scientist, photographer and specialist hobbyist spend the effort or are so preoccupied with this particular part of the fishes anatomy. The reason is that many of the different families or genera within this group of fish have totally different teeth and mouth formations, yet are externally similar. By way of comparison, have a look at our photo of a Royal Pleco's (Panaque nigrolineatus) mouth or that of a Sultan Pleco (Leproacanthicus joselimai). Having a closer look at a fishes mouth is sometimes the only husbandry clue aquarists are given. The type, size and dentition within the sucker mouth tells us much about the diet and overall lifestyle of the fish in question. From the photo above, an experienced aquarist can make a fair estimate of what and how to feed this fish. The overall size of the mouth isn't very big in relation to the size of this large fish, so it most likely requires gently flowing water. A fish used to a faster current would have a larger sucker mouth and a more flattened body in general. The wide but smooth teeth (the darker pink areas in the photo) lend themselves to casual grazing from the substrate and river-worn rocks. This fish is more interested in the contents of algae and mulm than the debris itself as it hasn't the rasping teeth of an out-and-out herbivore or the specialised dentition of a meat scavenger. Perhaps a good diet would include some vegetation, but not to the exclusion of sinking catfish tablets and meaty foods. Striking colouration and interesting teeth aside, this fish is al pleco. It will attain a large length, eat you out of house and home, endear itself to all its observers and re-arrange its tank to suit itself. This all adds up to a great pet! Type Locality Rio Piracicaba, San Paulo, Brazil. Identification Very similar to H. regani from the same river. H. margaritifer is deeper bodied and generally more chunky. Sexing Unknown although examination of the genital area in a group of large adults should show differences. Other Parameters Slightly soft water is preferable. Feeding Most greens are accepted (cucumber and courgette / zucchini seem favourite), but this fish loves to chew on dead fish and will accept most sinking foods once acclimatized. Furniture Plants must be well rooted and protected by rock work to avoid accidental up-rooting. Rocks and Bogwood do well, especially large rounded rock. This fish is equally happy on sand or large pea-shaped substrate. Compatibility As with most large Loricariids, this is a territorial but otherwise peaceful fish. It can be mixed with small fish more easily than other large catfish. Once an appropriate size, will withstand the rigours of an American Cichlid tank. Suggested Tankmates Anything from tetras to large cichlids, preferably South American, but will mix with all sizes of community fish - be careful adding it with other large catfish that everyone has room to grow. Breeding Unknown - a real challenge!